Leningrad recreates one of the most crucial campaigns of the Second World War, the northern wing of Operation Barbarossa in which German forces drive along the Baltic coast to take Leningrad and trap the Soviet fleet. The German military was at its operational peak: panzer divisions provided the striking power, the sturdy infantry divisions followed behind to hold the line and secure conquered territory, while overhead the Luftwaffe provided combat support and attacked marching enemy columns. Division-for-division the Soviets were outclassed, but they had plenty of ground to give to gain time for their massive reserves to reach the front. Historically the Soviets just managed to keep the Germans out of Leningrad, but it might easily have turned out differently. 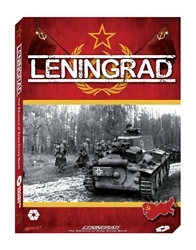 Leningrad, based on the award-winning Panzergruppe Guderian game system, features an easy-to-learn rules format to allow players to get right into the action. All the elements of mechanized battle�air power, armor, infantry, logistics, reserves�are present. Game mechanics are straightforward, but the situation facing the players in anything but simple. The strength of Soviet units is unknown to both players until they are first tested in battle, creating the possibility of nasty surprises for either side. The initial Germans superiority and allows them to cut through the Soviets almost at will, but at times the drive must be curtailed to ensure protection of supply lines and to pull units out of the line to replace losses. Continuous Soviets reinforcements enable them to take the battle to the Germans, but strength must be held back to form new defensive lines. The player best able to balance means with objectives, and to avoid mistakes, will win. Components: 8 page rule book, 100 die cut counters, one 11� x 17� map.